At the outset we, AIBSNLEA Kerala , Congratulate one and all of you on your qualification to become JAO in BSNL . AIBSNLEA was formally launched on 1st May, 2004 by merging 10 DoT recognized Group-'B' officers Associations & thus represents in true sense all disciplines of Executives of BSNL i.e. Telecom Engineering, Telecom Finance & Accounts, Civil / Electrical / Arch./ TFs Engineering Wings, Personnel Staffs (PA/PS/PSS), CSS Staffs, AD(O/L) & General Disciplines of BSNL. So , AIBSNLEA is the only one association standing/fighting for all the benefits of all the executives in Telecom Finance & Accounts department . From the very beginning, one association has been standing/fighting against the profits of the executives in Finance & Accounts department through series of destructive measures . Last one in the series was their destructive letter to CMD BSNL demanding no more recruitment of Finance & Accounts personal to BSNL . But, as usual, AIBSNLEA has to fight for Finance & Accounts department by writing to CMD to recruit young JAOs for the benefit of BSNL . Thus only because of AIBSNLEA, young DR-JAOs are joining to BSNL. AIBSNLEA sincerely Welcomes every one of you to BSNL. AIBSNLEA ‘s request : give life to young DR-JAOs in BSNL for the benefit of BSNL <<< Click to view Letter>>>. AIBSNLEA Kerala extends sincere regards and gratitude to CGMT Kerala Dr.PT Mathew in taking instantaneous action on our letter for the immediate actions to switch off of DTAX at Medical College , Trivandrum to stop additional fatigue in tune of lacks and lacks of rupees to already bleeding BSNL .Within hours of reception of our letter, PGMT Trivandrum Shri. SS Thampi issued office note to close down the DTAX. Thus, timely intervention of AIBSNLEA could contain the seepage of BSNL wealth. CS writes to CGMT Kerala for the immediate actions to switch off of DTAX at Medical College , Trivandrum to stop additional fatigue in tune of lacks and lacks of rupees to already bleeding BSNL . The DTAX is being kept powered on by eating a huge 300 Amps of DC current to switch and consuming heavy AC current for its Air conditioning . This Switch and its Air Conditioning are contributing a big portion of KSEB monthly bill of rupees 18 Lacks to Medical College Exchange. Keeping ON the DTAX without any time slot to switch by leaking ten thousands of rupees per day from BSNL exchequer is suspicious. CS writes to PGM(F) Kerala Circle to arrange the annual GPF balance slip to every employee through DOT website or through ESS portal of BSNL so that every employee can confirm that the GPF balance available with ESS portal is tallied with DOT. Hon'ble CAT Bench Chandigarh in an OA No. 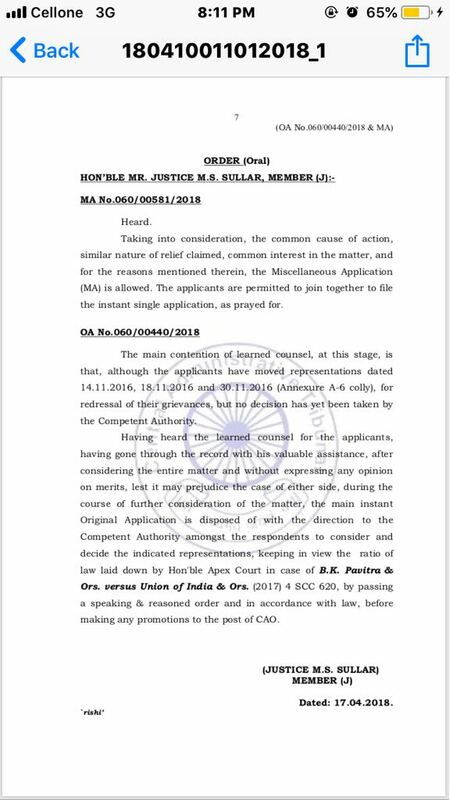 060/00440/2018 delivered its judgment on 17.04.2018 disposed of the OA with the direction to the competent authority amongst the respondents to consider and decide the indicated representations, keeping in view the ratio of law laid down by Hon'ble Apex Court in case of B.K. Pavitra & Ors. versus Union of India & Ors. 4 SCC 620, by passing a speaking & reasoned order and in accordance with law, before making any promotion to the post of CAO. A meeting of the All Unions and Associations of BSNL (AUAB) was held today the 24.04.2018. Com. Chandeswar Singh, GS, NFTE, presided over. Representatives of BSNLEU, NFTE, SNEA, AIBSNLEA, FNTO, BSNL MS, BSNL ATM and BSNL OA, participated. 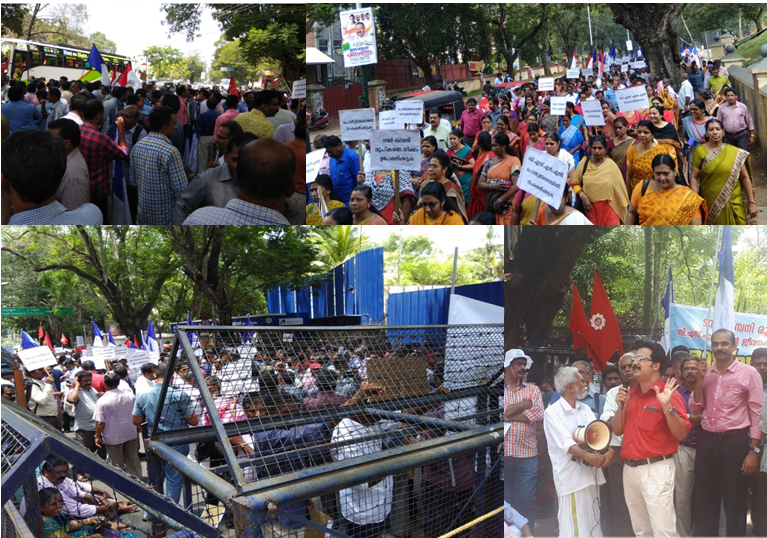 (1) It is decided that street corner meetings are to be conducted throughout the country, from 07th to 11th May, 2018, against formation of the Subsidiary Tower Company and against the anti-BSNL policies of the government. (2) It is decided that on the last day of the above campaign, that is on 11th May, 2018, massive demonstrations are to be conducted throughout the country, and fax messages are to be given to the Prime Minister against formation of the Subsidiary Tower Company. (3) On the issue of wage revision, it is noted that the DPE has replied to the DoT, stating that the pay revision issue could be taken for the approval of the Cabinet. In this regard it is decided that, immediate meetings should be sought with the Hon’ble Minister of State for Communications and the Secretary, DoT, to discuss the issues of wage revision, pension revision and pension contribution. (4) As regards holding a National Convention against formation of the Subsidiary Tower Company, the last meeting decided that the same could be held on 09th or 10th May, 2018. The issue was discussed in today’s meeting. In view of the campaign programme to be conducted against formation of Subsidiary Tower Company from 07th to 11th May, 2018, it is decided to defer the date of this Convention. The exact date of holding the convention will be decided in the next meeting of the AUAB. The next meeting of the AUAB will be held at 11:30 hrs on 08th May, 2018, in AIBSNLEA’s office at Eastern Court. Today morning at 11.30 Hrs, Smt. Sujata Ray, Director (HR), BSNL Board inaugurated the AIBSNLEA CHQ Office at Room No. 19, IR Hall, Eastern Court, BSNL Corporate Office, New Delhi amidst rituals. GM (SR) and OSD to Director (HR) were present as the Guests of Honour. Besides these, General Secretaries and Presidents of sister Unions and Associations also attended as special guests namely Shri M.K. Bagchi, Convenor, United Forum of MTNL Unions and Associations, Shri A.K. Kaushik, GS, TEAM, MTNL, Shri Mage Ram, President United Forum of MTNL Unions and Associations, Shri K. Satyanarayana, Ex. CHQ President, Shri G.R. Sharma, Ex. AGS (Finance), Shri C. Singh, General secretary, NFTE (BSNL), Shri Islam Ahmed, President, NFTE (BSNL), Shri R.S. Chauhan, Circle Secretary, BSNL EU, NTR Delhi Circle, Shri K. Sebestin, General Secretary, SNEA, Shri A. Khan, President, SNEA, Shri Ravi Shil Verma, General Secretary, AIGETOA, Shri B.C. Pathak, FS, FNTO (BSNL), Shri Anil Tiwari, General Secretary, TOA BSNL (BMS) Shri Suresh Kumar, General Secretary, BSNL MS. Shri Kishan Singh, General Secretary, AIRBSNLEWA, Shri Darbara Singh, Circle Secretary, Haryana Circle AIBSNLEA, Shri M.K. Marodia, Circle Secretary, Rajasthan Circle AIBSNLEA, Shri P.D. Sharma, Circle Secretary, Delhi Circle AIBSNLEA and Shri V.P. Singh, Circle Secretary, BSNL Corporate Office Circle AIBSNLEA. In response to AIBSNLEA communication regarding affairs in the Maharashtra Circle, Kerala Circle and Karnataka Circle, Director (HR) directed GM (SR) to call for the comments of respective circles. Accordingly, GM (SR) has called the report from the respective circles. Now, we have to pursue the matter in DoT for the preparation of the Cabinet Note. 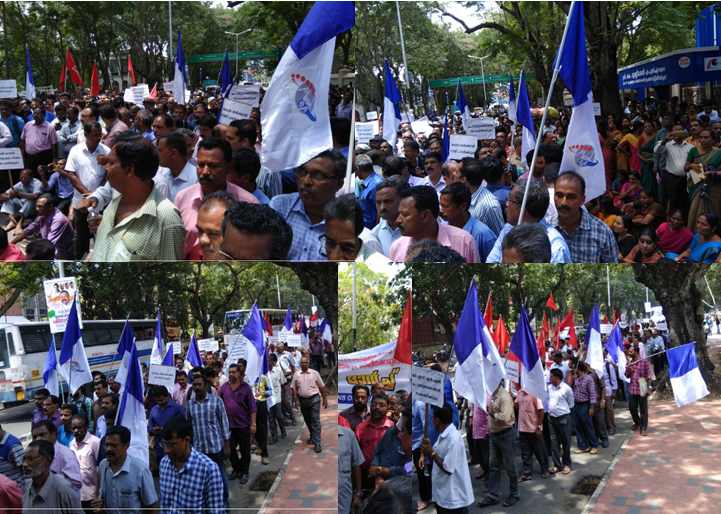 Raj Bhavan March Starts from Musium Junction , Trivandrum at 11.00 AM sharply on 19-04-2018 (Thursday) by AUAB . All Circle Office Bearers , District Office bearers are requested to join the March well in advance ( around 10.30 AM) with maximum members in full zeal . Settlement of pay fixation as well as payment of arrears in respect of JAO 2010 batch. A meeting of the All Unions and Associations of BSNL was held today. The meeting was presided over by GS, AIBSNLEA. The meeting reviewed the implementation of the earlier decisions taken, on the issue of Subsidiary Tower Company. It called upon the employees to powerfully organize the “March to Raj Bhawan” programme, to be held on 19-04-2018. It requested the employees to utilize this opportunity to effectively make a campaign among the general public, exposing the ill effects of the Subsidiary Tower Company. The next meeting of AUAB is decided to be held on 24.04.2018 at 11.00 Hrs. to discuss and decide the strategies for successful implementation of National Convention and filing a court case against the Subsidiary Tower Company. A Implementation of of Hon'ble Supreme Court Judgment dated 12.12.2017 in CA No. 392 of 2017 and dated 14.12.2017 in the matter of seniority of TES Group B Officer as per the Rule 206. We requested for the implementation of of Hon'ble Supreme Court Judgment dated 12.12.2017 in CA No. 392 of 2017 and dated 14.12.2017 in the matter of seniority of TES Group B Officer as per the Rule 206. Director (HR) assured to discuss the matter with GM (Pers.) today itself for further necessary actions. B Withdrawal of filing of SLP in the matter of fixation of Officiating JTOs under FR 22 (i) (a)(i): We requested to implement the judgment of Hon’ble High Court of Kerala in the matter of fixation of Officiating JTOs under FR 22 (i) (a)(i) instead of filing of SLP in Hon’ble Supreme Court in the larger interest of BSNL. Director (HR) assured to discuss the matter with CGM (Legal) and GM (Estt) in this regard. We again submitted our letter dated 20.03.2018, addressed to CMD BSNL, to Director (HR) as ready reference and she directed on the letter itself to GM (Estt) to discuss the matter. C Issues related to Finance Wing of Maharashtra Circle: We requested for her kind intervention in the affairs of Maharashtra Telecom Circle of Finance Wing where the Finance Executives are being transferred on the pretext of look after arrangements. The executives even after declining the promotion are being forcefully relieved. Director (HR) assured to look into the matter. D Discontinuance of Look After Arrangements in the grade of EE (Civil): We drawn attention of Director (HR) towards BSNL CO, BW Unit letter number OA-2905/2015/DM (BW-I) dated 07.02.2108 and protested against such thoughtless, irrational and illegal order. After some discussions, Director (HR) assured to get withdrawn the letter. E Grant of Special CL to the Office bearers of AIBSNLEA at Circle and District levels: We requested Director (HR) for grant of Special CL to the Office bearers of AIBSNLEA at Circle and District levels. Director (HR) immediately spoke with GM (SR) and directed him to discuss the matter for further necessary action. F Inauguration of AIBSNLEA CHQ office in BSNL CO: We requested Director (HR) to inaugurate our CHQ office in Room No. 19 of IR Hall, Eastern Court, BSNL Corporate Office. Director (HR) mentioned that let the room be fully renovated just thereafter she will come and inaugurate the office. We are expecting that the civil work in the room will be completed by this week end thereafter the date of inauguration will be decided. GS contacted senior officers in DPE to know the status of reply on the proposal of DoT for implementation of 3rd PRC report in BSNL. It was informed that the draft reply to DoT is in process for approval of competent authority. On return of the Director (DPE) from tour, the reply will be send to DoT in the next week. 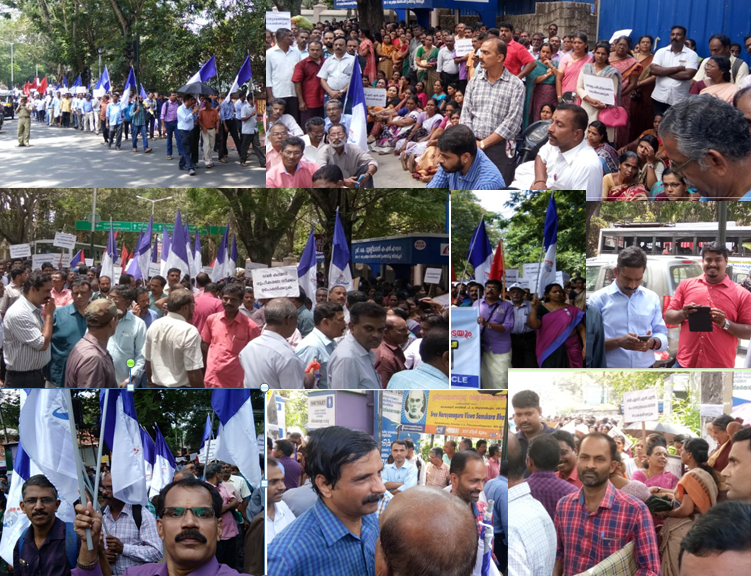 The Dharna on 12 04 2018 demanding the rolling back of the subsidiary tower company by all the Unions and Associations of BSNL was a grand success . The second and most important phase of this agitation is the Raj Bhavan March on 19/04/2018 (Thursday) . Compelling the government to roll back the Subsidiary Tower Company is the priority task of the trade union movement of BSNL. To achieve this, the All Unions and Associations of BSNL have called on the BSNL employees to organise massive “Dharna” throughout the country at BSNL CO, Circle and District Head Quarters on 12-04-2018. All the Circle and District Secretaries of AIBSNLEA are requested to coordinate with the other constituents of the AUAB and to mobilise maximum number of Non-Executives and Executives in the Dharna. 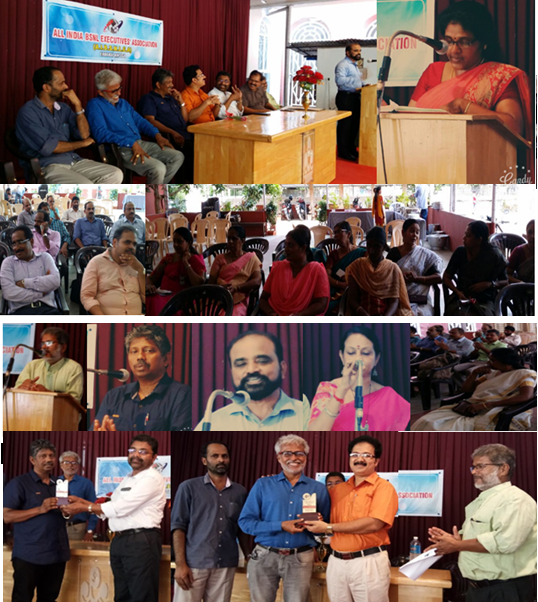 GB and Retirement Send Off function of Ernakulam Branch has been conducted on 07-04-2018 at Chavara Cultural Centre near South Railway Station . Meeting started with Prayer by Com.Mini . Com KS John , Com Manmadhan MV were given befitting send Off . Com. Krishna Kumar Welcomed the gathering ... and Com.George NA , AFS extended Vote of Thanks . Com.Latha K , DS reported the organisational activities and details of new members added . Com . Alias Chacko DP presided over the meeting. CHQ VP Com.Baby Rani , CP Com.Vijayakumar , CS Com.Shaji , CVP Com.Binu and CWC Member Com.Krishna Mohan joined the grand meeting. We strongly demanded to bring back of all the SDEs on completion of 2 years of their service in the currently working BA , as we have clearly submitted on 21-03-2018. Moreover we requested to consider completion of two years of service until 31st August 2018 , since some executives were relieved only in August 2016 due to administrative reason. Against the SDEs coming back to Parent BA, equal number of SDEs may be shifted from long stay list for the smooth operation of all BAs as being done in Kerala Circle . GM appreciated and shared our views and pointed out that one Association is very adamant in not shifting SDEs from long stay list and requesting SDEs request transfer may be considered with JTOs. We totally disapproved this view due to the fact that some of these SDEs are AGM(LA) in the presently working BA and how JTO at E1 scale can be considered against AGM post ? . Moreover GMs of those BAs already communicated that these SDE/AGM(LA) cannot be relieved to requested BA without getting proper substitute . This is an unfair/unlucky stand of that association for some selfish reason and this stand made the return of the two year completed SDE/AGM (LA) uncertain. 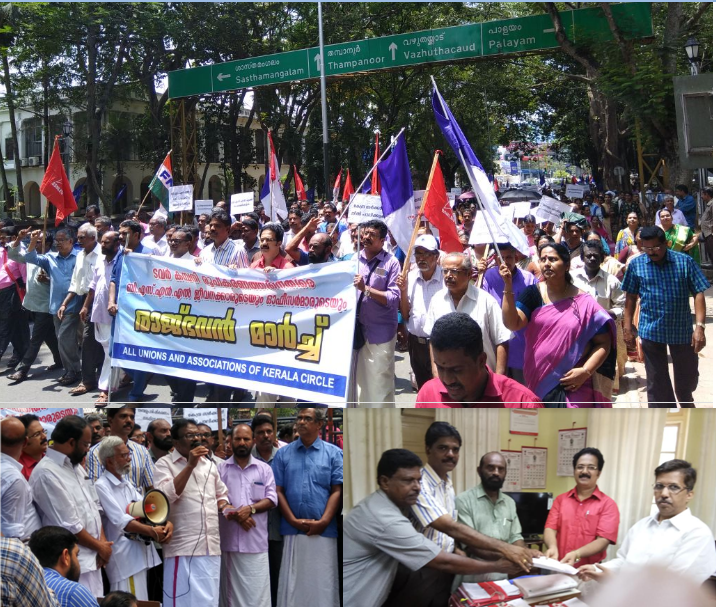 We strongly worded that AIBSNLEA will not permit unnecessary discrimination and dilution of transfer policy being followed in Kerala for some vested interest . GM(A/HR) assured to convey our clear and legitimate stand to CGMT . AIBSNLEA already taken up this matter with management and assured to consider the request when formalities are completed. As and when Certificate Verification, Police Verification and Community Certificate Verification : If applicable of the requesters are completed , the mutual transfer requests will be considered . We request those requesters to pursue the verification completion. All the six requests we have received are being pursued. Meeting with GM(FP): GS, FS and AGS (Finance) met with GM(FP) and discussed regarding consideration of some request / tenure transfers and modification of some transfer orders. GM(FP) mentioned that request/ tenure transfers will be examined but the modifications can be considered only on genuine grounds by the competent authority. Status of 3rd PRC implementation in BSNL: GS discussed with Director (DPE) and Assistant Director (DPE) regarding reply to be sent to DoT regarding 3rd PRC implementation in BSNL. Director (DPE) mentioned that till 9th April 2018 all the Officers in DPE are busy with the convocation being held on 9th April 2018 which will be addressed by Hon'ble Prime Minister. Thus the reply to DoT will be sent in the next week only. It is understood that after receiving reply from DPE, Hon'ble MOSC (I/C) will take up the matter in the Union Cabinet for the relaxation in affordability clause of 3rd PRC report. A meeting is called for by CGMT Kerala with recognised Associations/Unions ( AIBSNLEA/SNEA/BSNLEUand NFTE) on 10/04/2018 @2.30PM to discuss the following matters. a) Status of financial targets achieved during the financial year 2017-18: We enquired about the status of financial targets of BSNL in the year 2017-18. CMD mentioned that it is satisfactory in the present scenario and thanked the DoT administration for releasing Rs.3700 Crores dues of BSNL against NOFN, NFS and other projects to BSNL before 31st March 2018.
b) 3rd PRC implementation in BSNL: We appraised him about our discussions took place with the senior officers of DPE regarding DoT letter seeking clarifications to take the necessary steps for implementation of 3rd PRC in BSNL. DPE officers has confirmed the receipt of DoT letter along with the recommendation papers of BSNL Board decision and they explained that DPE will reply to DoT shortly suggesting to take up the matter with the Union Cabinet for the relaxation in the affordability clause of 3rd PRC report. We requested CMD BSNL to use his good office in the MOSC office to move a Cabinet Note in this regard. CMD assured to look into the matter. c) Holding of CPCs to fill up the vacant Group-A and Group-B level posts: We requested CMD BSNL to give clearance to Pers. Cell to initiate CPCs fill up the vacant Group-A and Group-B posts subject to outcome of the Court Cases where no stay order on promotions has been granted. CMD mentioned that he has already directed GM(Pers.) to process the proposal and will further discuss the matter with Dir(HR) for an early action. d) Implementation of E-2 E-3 standard pay scales to the JTO and SDEs equivalent Executives and upgradation of subsequent pay scales as per BSNLs earlier proposal dated 06.06.2016: CMD assured to discuss the matter in DoT with the concerned officers. e) Implementation of Hon'ble Apex Court Judgements on TES Group-B seniority: We requested CMD BSNL for early implementation of Hon'ble Supreme Court Judgements on TES Group-B seniority to avoid contempt of Court Cases. CMD assured to look into the matter. Meeting with Dir(HR) BSNL Board:- GS, AGS(HQ) and AGS (Finance) met Dir(HR) BSNL Board and discussed regarding. a) 3rd PRC implementation in BSNL: We appraised her about our discussions took place with the senior officers of DPE regarding DoT letter seeking clarifications to take the necessary steps for implementation of 3rd PRC in BSNL. 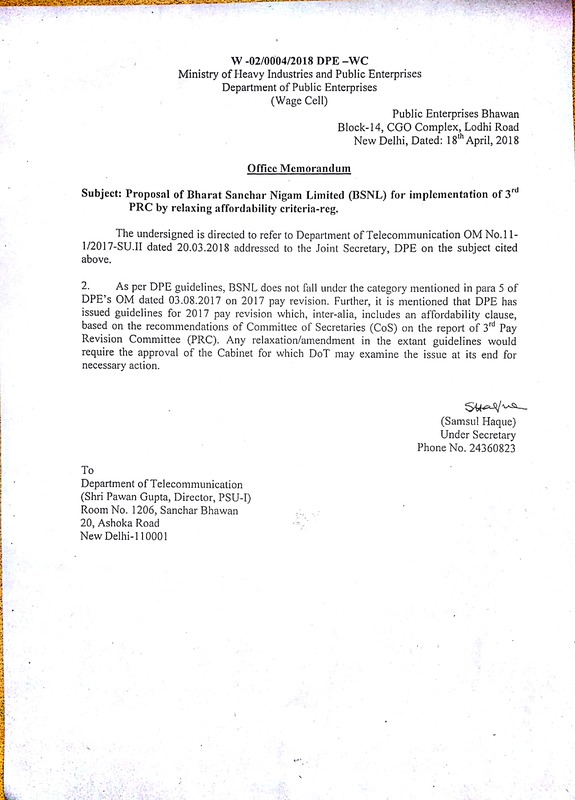 DPE officers has confirmed the receipt of DoT letter along with the recommendation papers of BSNL Board decision and they explained that DPE will reply to DoT shortly suggesting to take up the matter with the Union Cabinet for the relaxation in the affordability clause of 3rd PRC report. We requested Dir(HR) BSNL Board to use his good office in the MOSC office. Dir (HR) mentioned that in one informal gathering she has heard Hon'ble MOSC(I/C) regarding implementation of 3rd PRC in BSNL wherein Hon'ble MOSC(I/C) told that 3rd PRC will be implemented in BSNL for which he will take up the matter in the Union Cabinet for relaxation in the affordability clause of 3rd PRC report. Thus 3rd PRC will be implemented in BSNL but the process may take some time. c) Implementation of E-2 E-3 standard pay scales to the JTO and SDEs equivalent Executives and upgradation of subsequent pay scales as per BSNLs earlier proposal dated 06.06.2016: Dir (HR) mentioned that though Dot has referred the matter to DoE for comments but it seems that 3rd PRC implementation and upgradations of Pay scales settlement may be a difficult task. However, efforts will continue for the resolution of both the issues. d) Implementation of Hon'ble Apex Court Judgements on TES Group-B seniority: We requested Dir (HR) BSNL Board for early implementation of Hon'ble Supreme Court Judgements on TES Group-B seniority to avoid contempt of Court Cases. Dir (HR) mentioned that necessary action is being taken by Pers. Cell in this regard. However, she will further discuss the matter with GM(Pers) and Jt. GM(Pers). e) Grant of special C/L to AIBSNLEA Circle/ District level officer bearers: We requested Dir (HR) to grant special C/L to the AIBSNLEA Circle/ District officer bearers also for attending the various associations meetings and for its smooth functioning. Dir (HR) assured to discuss the matter with GM(SR). f) Allotment of Association office to AIBSNLEA in BSNL Corporate Office: We extended our sincere thanks to Dir (HR) for the allotment of Association office to AIBSNLEA in BSNLCO. AIBSNLEA has been allotted Room No.19 in IR hall of Eastern Court campus which is under renovation. AIBSNLEA will shortly operate its office in room no.19 of IR Hall . Congratulations Com. Joseph John ….. It's a great and deserving event……. Com. Joseph John has taken over the charge Circle IFA , GM(Fin), of Odisha Circle on 31.03.2018 from Shri Santhosh Kumar Seth who goes on transfer to Chhattisgarh Circle . Com. Joseph John had been promoted to DGM(Adhoc) from Thrissur BA to Odisha Circle in 2016 . He is an active member/organiser of AIBSNLEA and started his career as JAO . We extent sincere wishes to him .